Here is a handy list of tips to keep in mind the next time you get into it with your mate. Relationships are tough to manage. Blending a couple’s individual needs, preferences and personality styles takes a lot of effort and even in the best marriages, there are times when conflicts arise and tempers flare. Knowing how to deal with anger in a constructive way rather than blindly reacting can prevent worsening an already difficult situation and lengthening the duration of unpleasant episodes. 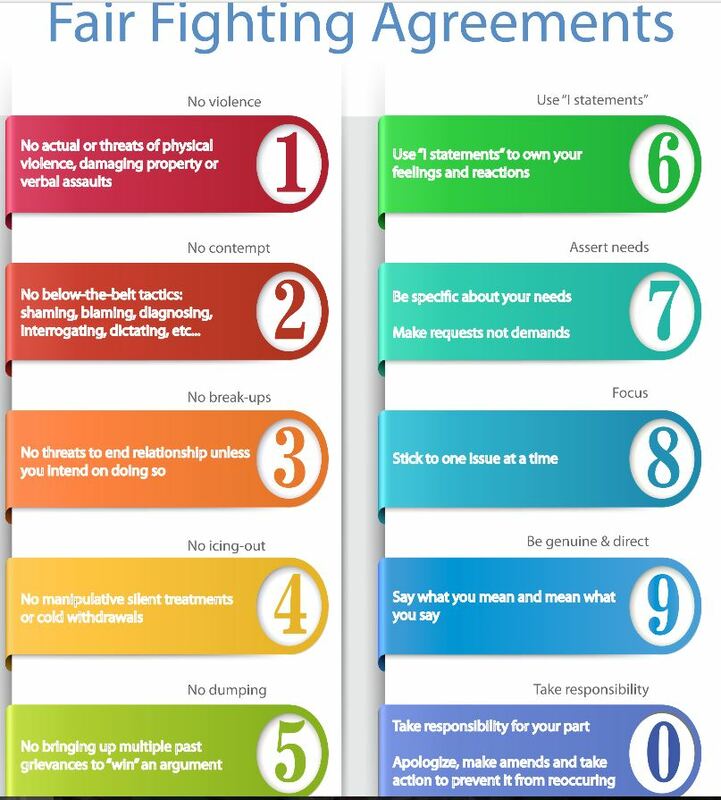 Although all of the above suggestions are good, #6 is especially important and in fact is the secret to successful conflict resolution: Use I-Statements. In other words, talk about your experience, (that is what you are feeling and what you want), rather than attacking or criticizing what you don’t like about your partner. For example, think of a situation where your partner has made you mad. Perhaps he promised to pick up the dry cleaning and didn’t or she did something that you didn’t expect, like inviting the annoying neighbors over without telling you. An impulsive response might be to react with you-statements: What is wrong with you? You- statements make having a discussion difficult because they put the other person on the defensive. No one likes to be directly criticized and … they usually will either counterattack, defend themselves or withdraw. None of these options further the conversation or make progress toward finding a resolution to the problem. In contrast, an I-Statement response would sound like: I feel angry when you broke your promise and I wish you would consider my feelings in the future and keep your word – or I hate it when people just show up. I would really like it if you would check with me first. Focusing on your experience and not attacking allows for an explanation or an apology and makes it easier to remember that you really do love the person who you are talking to. Although it takes a little work, with practice, nasty arguments can be transformed into productive conversations that can reach effective solutions. While angry conflicts are inevitable from time to time in intimate relationships, they don’t have to be frequent or destructive. Over time, learning to use I-statements will significantly lessen their frequency, duration, and intensity.